Stylish, efficient 50s robbery flick that holds its own among better known examples of the time. Standard form for heist movies typically sees a good two-thirds of the story detailing the set-up and the showpiece execution of the crime, with the final third showing it all unravelling. 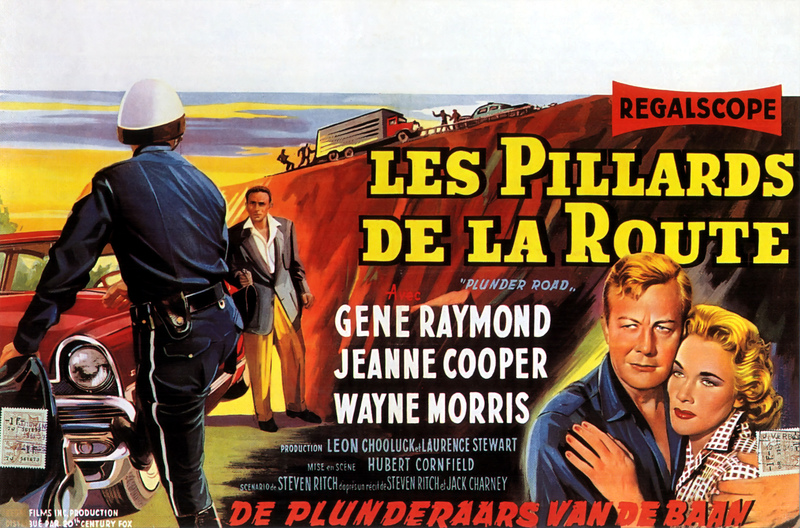 “Plunder Road” doesn’t bother with all that, and instead opens with a mostly silent, night time train robbery in the rain where the haul is $10,000,000 in gold. “Plunder Road”, then, lives up to its title in that it’s the escape with the loot across the highways and backroads of America that fills most of its tight, efficiently directed 72 minutes. Gene Raymond plays Eddie, the brains behind the heist who’s also on his first and last job. Backing him up are seasoned veterans, including the inimitable Elisha Cook Jr., who split the loot into three trucks and make for LA, hoping to avoid the ever tightening cordon of roadblocks. It’s an interesting entry in the film noir genre, picking and choosing the elements associated with it. It has the cynicism but no femme fatale. It has that overlooked curiosity of noir – technology (indeed, it’s the undoing of one character) – but no double-cross or betrayal. It has the confident orchestrator but no antagonist. And it has the power of the city – the gang hide when in the countryside but understand being in plain sight in the city provides all the cover they need. Slowly but surely, the plan goes awry, and one by one, the gang get caught, as you would expect. The survivors melt down what’s left of the gold and two years before Ian Fleming has Auric Goldfinger do it in his 1959 James Bond novel, they cast it into car body parts to smuggle it out of the country. What could possibly go wrong? A worthwhile film and one that sits comfortably alongside better known heists such as “The Killing” or “The Asphalt Jungle“.